Dr. Jones’ training is unusual in both quality and quantity. There are few surgeons who have had such an extensive preparation of over 20 years. It began at Emory University in Atlanta where Dr. Jones completed his pre-medical studies. While at Emory, he received a Rotary Scholarship from the state of Georgia in recognition of his leadership and excellent record. On account of the scholarship and his outstanding work at the Medical College of Georgia, he was able to attend the University of Canterbury in New Zealand, and the Honours School of Physiology in the Medical School at Oxford University, England, over a three-year period. Thereafter, he completed his MD at the Medical College of Georgia, earning four degrees in four years. Twelve years of surgical training followed; two years were spent in general surgery with the first at the Medical University Hospital in Charleston, South Carolina, and the second in Baltimore, Maryland. Four years of rigorous training followed at the world-famous John Hopkins Hospital specializing in facial surgery. At Hopkins, the emphasis was on the face, the head and neck, nasal anatomy, the sinuses, ear surgery, and neck structures. The fourth year at Hopkins, Dr. Jones became a faculty member and was active in teaching and directing surgical residents specializing in ear, nose, and throat surgery (ENT). This was followed by three years at the renowned Plastic Surgery program at Stanford University in California where many pioneering events in Plastic Surgery have taken place. Plastic surgery is advanced and pushing innovation in California. The area’s fascination with youth and appearance makes it a most competitive place to train in plastic surgery. Moreover, Dr. Jones was given, as a representative of Stanford, a Fulbright Fellowship to study in Paris, France, for a year with the geniuses of plastic surgery. They included Dr. Paul Tessier, who is the father of facial-cranial surgery; Dr. Yves Illouz, the inventor of liposuction; Dr. Vladimir Mitz, whose studies and techniques have advanced the facelift procedure into its modern form; Dr. Renee Malik, who has pioneered children’s cleft lip and cleft palate surgery; Dr. Dardour, who was a pioneer in hair flaps; and Dr. Jost, the French nose surgeon who, like Dr. Jones, has completed training in both ENT and plastic surgery. Dr. Jones moved to Atlanta in November 1989 to return to his native Georgia for several reasons. First, he wanted to bring back to his native Georgia the fruits and the skills he had obtained from his 21 years of training at the leading centers of plastic surgery in the United States and in Europe. Second, he wanted to help make Atlanta a better center of expertise in plastic surgery. Finally, he wanted to raise his family in Atlanta, his home. 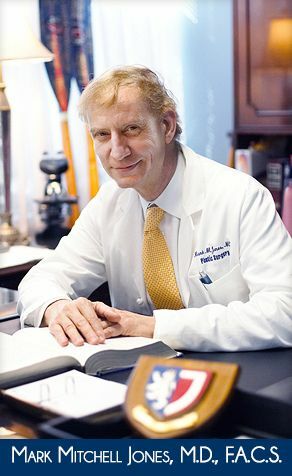 Dr. Jones’ professional papers have appeared in several medical journals, including The Annals of Plastic Surgery. He has also presented at multiple conferences including the American Society of Head and Neck Surgery and the XIII World Congress. He has been quoted and interviewed by such general magazines as Women’s Daily and for CBS television’s Sixty Minutes by Diane Sawyer as well as local television stations. He is also a guest speaker and lecturer in the community. He has been a participant in the nationally recognized Interplast program volunteering his services to the poor children of South America who cannot afford to have surgery on their cleft lips or cleft palates or burn scars.